Building a more equal workplace. 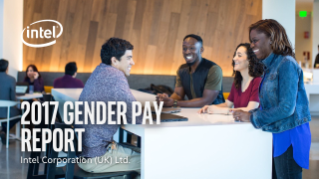 Intel UK gender pay gap analysis. Members of IGLOBE (Intel Gay, Lesbian, Bisexual, or Transgender Employees) group offer advice in this "It Gets Better" video campaign. Former fellows and members of GEM talk about their experiences and why diversity is so critical to success. Intel IGLOBE Employees Say "It Gets Better"